Wednesday, April 17th, 2019 at 4:30pm. We want to know from you, What are some of your routines & habits? What makes your morning a million dollar morning? Your routines make you better and helps to make you who you are. Websters dictionary defines Routine as: noun-> a sequence of actions regularly followed; a fixed program. Or as an adjective -> performed as part of a regular procedure rather than for a special reason. Wednesday, April 17th, 2019 at 3:08pm. Well its that time of the month again, the latest Examiner Ad. 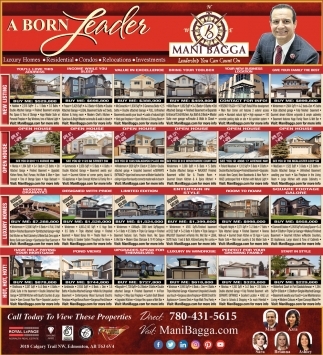 We are so thankful to have a resource like the Edmonton Examiner to preview the many properties we have for our clients who have put their trust in us with their most expensive and valuable possession, their HOMES! Wednesday, April 17th, 2019 at 10:55am. Friday, April 12th, 2019 at 6:10pm. Friday, April 12th, 2019 at 9:33am. Friday, April 5th, 2019 at 10:54am.